Hello and welcome to the Simon Says Stamp Wednesday Challenge! I am thrilled to be in the March Designer Spotlight! The challenge this week is "Come Rain or Shine". Show us your weather themed cards! 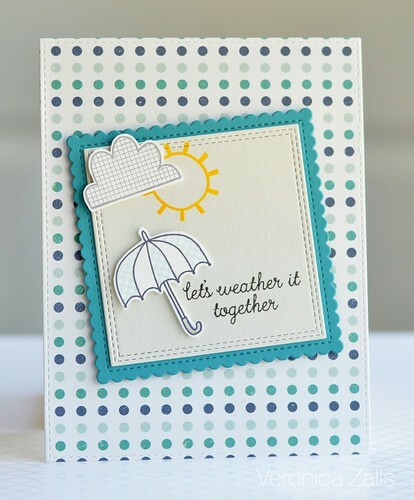 I used the super cute Reverse Confetti stamp set "Weather It Togetheri" to create my card. My patterned paper is from the American Crafts 6x6 paper pad "True Stories". Now don't forget for your chance to win a $50 SSS shopping spree just create a card and upload using the inlinks link up on the SSS Challenge Blog. Thank you for stopping by and have a wonderful week! Cute design - I love your "raindrop" background paper! Great card! I like that there is a lot of color, but you didn't color the umbrella image. Such a lovely card of encouragement for someone special! Beautiful CAS design. So sweet! I love the paper you chose and the grid cloud!